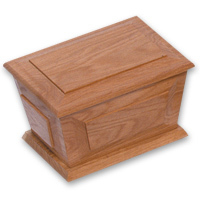 Sloping sided solid oak ashes caket. Raised panels to sides and ends, raised lid. Max. exterior dimensions (in cm) 20W x 28L x 18.5H.